Using a smartphone at the table. 18% of Britons check their phones at least 3 times at while at a restaurant. 17% admitted they share an experience on social media. 27% of restaurant visitors take a photo while eating out. It now seems that the anti-social behaviour of using your phone at the dinner table is becoming the more common thing. 30% of people are eating out more often than they did 10 years ago. 93% of adults in the UK own or use a mobile, and the fact that 72% have at least one social media profile means that being able to share your eating experience is now easier than ever. Being able to 'Check in' to a restuarant via social media is the common way of registering where you are eating. Rather interestingly three-quaters of doing so were at a high-end burger chain. 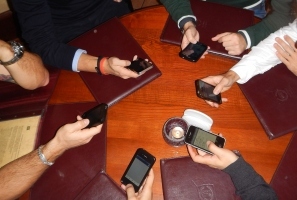 Of course there is a more practical reason for people using smartphones when dining out. 12% of the people surveyed said they used their phone for mobile payment at a restaurant. However, 43% said they had never used their smartphone to pay, but they were open to the idea in the future. Social media is quite often the first port of call for unhappy customers. Surprisingly, while 26% shared positive experiences in the study, only 7% were negative. What are your thoughts of using your smartphone at the dinner table? Or in a restaurant?